Three Step Lead Generation Program Can Yield Big Results. When we decided to do our own direct mailing to help acquire new clients, we wanted a campaign that would command attention. Sending out direct mail is easy. We’ve been doing it for other companies for over 15 years. Sending a promotion that stands apart from other mail and that generates the highest response rate possible is not as easy. 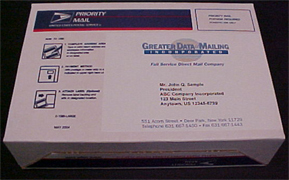 Talon Mailing & Marketing and our sister company, Greater Data & Mailing wanted to generate qualified leads and also show the direct-mail industry that we are capable of producing innovative and exceptional mailings. In past years we had fallen into the same trap as many other companies: We thought we could design our own letter (or postcard) and just mail it out. While low-cost, in-house efforts can sometimes yield good results, we came to realize that an experienced creative consultant (or experienced advertising agency) could drastically improve our response rates and campaign results. Lee liked that we have worked with the NY Yankees for many years and suggested we use this relationship to get people to open our envelope. After getting permission from the Yankees, Lee recommended we mail an unassuming #10 envelope addressed to our prospect with a first class postage stamp. The top left of the envelope contained “New York Yankees” and their famous logo. Our return address, without a company name was on the other side of the envelope. Whether the recipient was a Yankee fan or not Lee knew this envelope had a great chance of being opened. In direct mail you can’t sell a product if you can’t get your prospect to open or look at your mailing piece. Pictured above: With a first class stamp and laser quality addressing this envelope has a high probability of being opened. 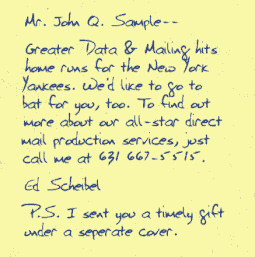 Inside was a letter on Yankee letterhead addressed to our director of sales, Ed Scheibel. The Merchandise Manager for the Yankees wrote a letter praising the great work we have done for the Yankees. To explain why we were sending this letter to the prospect, we laser printed (in blue) a yellow sticky note which was addressed to the prospect. The yellow note contained the prospect’s name and looked completely handwritten. The sticky note closed with a PS that we were sending a gift under a separate cover. About a week after receiving the initial letter, the recipient received a box. Inside the box was a personalized letter from Greater Data that Lee had written. The letter asked if the prospect’s direct mail was going “like clockwork?”. It went on to describe our organization and what we could do for the prospect. The mysterious gift mentioned in the first mailing turned out to be a complimentary desk clock with our name and phone number imprinted on it. 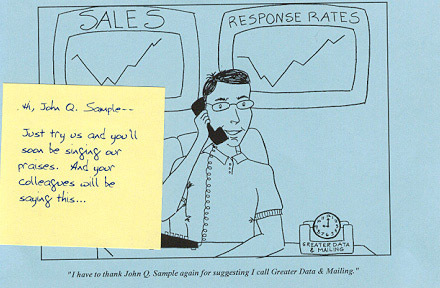 Also found in the package was a personalized cartoon showing the benefits of using our company, another personalized yellow sticky note, a personalized “no-obligation information request coupon”, a return envelope, a comprehensive postal rate book and a folded postal rate wall poster. Pictured above left: The Priority Mail package ready to be opened. 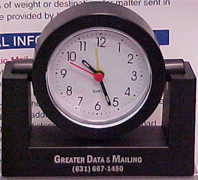 Pictured above right: Large complimentary desk clock with our name & phone number. Pictured above left: Personalized letter detailing the features & benefits of our company. Pictured above right: Peronalized cartoon and personalized yellow sticky note. Pictured above: Personalized "no obligation information request coupon". Also enclosed in the package but not shown: Comprehensive postal rate book and a postal rate wall poster. We are sending only 100 packages per month so our director of sales, Ed Scheibel can personally call each recipient after the second package arrives. By limiting the number of pieces sent, Ed will have time to meet with the prospects and/or provide any information or assistance that they may need. It’s too early to measure the number of new clients we will acquire from this lead generation program, but we are very pleased so far. We have priced new projects, lined up numerous appointments, and have outstanding new leads. Hiring a professional outsider to help us with this project was definitely the right choice. If you would like to break through the clutter and try a similar get-noticed campaign then please call us. 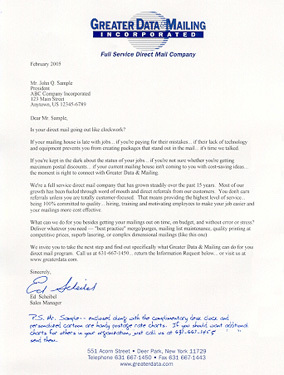 We can put you in touch with Lee and help you produce multi-step and dimensional mailings. ClickZ.com - a comprehensive & valuable source for internet marketers. Civildefensemuseum.com - Online Cold War Era Civil Defense Museum. Kids.gov - Links to federal kids’ sites and other great links for children. CinemaNow.com - Pay & legally download movies to watch on your Personal computer. Movielink.com - another pay site to legally download movies.